TRITON, also known as Trisis and HatMan, is one of only a few known malware frameworks that have resulted in a direct physical impact on critical infrastructure. In 2017 TRITON was used to attack a Saudi Arabian gas facility, directly interacting with, and remotely controlling, its Safety Instrumented System (SIS). Given the significance of this attack, Nozomi Networks conducted research on the malware to better understand how its multistage injection techniques work. We obtained a Triconex SIS controller and successfully communicated with it, including injecting the TRITON malware. Using the network traffic generated, we were able to analyze the proprietary TriStation protocol used to communicate with Triconex Safety Systems. Today we released a Wireshark dissector for the TriStation protocol — called the TriStation Protocol Plug-in for Wireshark. The dissector is available as a free download from GitHub, along with a packet capture (PCAP) of network traffic that includes TriStation communications. These tools are intended to give researchers and ICS organizations access to a clear visual dissection of SIS controller communications, helping them identify compromises and cyber security risks. The Nozomi Networks TriStation Protocol Plug-in for Wireshark is a tool developed during our in-depth analysis of the TRITON malware. More of our research, including a live demo, will be shown at Black Hat USA 2018. In December 2017 FireEye (full disclosure, FireEye is a partner of Nozomi Networks) reported that it had recently worked with an industrial operator whose facility was attacked by a new type of ICS malware they named TRITON. The attack reprogrammed the facility’s SIS, causing it to enter a failed state and resulting in an automatic shutdown of the industrial process. The shutdown led to the discovery of the malware and is thought to have been the result of a programming problem with the malware’s code. Likely TRITON was intended to prevent the SIS from safely shutting down the plant when used with a simultaneous attack on the process itself. SIS systems are designed to prevent critical process systems from causing safety, health or environmental incidents. They are the last line of automated defense for a plant (mechanical defenses also exist) and are a special kind of PLC with multiple redundant systems. While no harm occurred in this case, the attack represents a step-up in sophisticated ICS cyberattacks, being the first one to successfully interact with a SIS. During Nozomi Networks research on TRITON, we expanded our knowledge about the proprietary TriStation protocol used by the Triconex Safety Systems components. Some insight was extracted from the malware itself. Other knowledge came from the live traffic generated in our lab using a Triconex controller model MP 3008 with an NCM 4329/N/G communications module. A PCAP of this traffic was shared with FireEye, who worked with BSI (the German Federal Office for Information Security), to develop packet rules for detecting TRITON. We conducted our own analysis of the PCAP and realized that a tool capable of explaining the communications would be extremely helpful. Usually engineers analyze network traffic by intercepting it with a program called Wireshark. Wireshark is a very flexible tool that visually explains the meaning of each byte contained in captured traffic. It works well for known, well documented protocols but is ineffective when dealing with a proprietary protocol. To overcome this issue, Wireshark allows users to create their own dissector (protocol parser) to describe how to interpret unknown protocols. Some of the languages use to create dissectors are C++ and Lua. Because TriStation is a proprietary protocol not understood by Wireshark, initially the contents of the packets looked like raw data. We developed a Lua dissector that instructs Wireshark on how to parse the data contained inside each packet. With the dissector as a guide, Wireshark describes the meaning of each byte inside TriStation packets, making it easier for analysts to understand TriStation data traveling over a control network. We would like to emphasize that the functionality of the dissector is the result of our malware analysis and reflects the attackers’ reverse engineering of the TriStation protocol. Additionally, based on new findings gained during our TRITON research, our TriStation Protocol Plug-in for Wireshark detects the uploading of a malicious program related to TRITON. While we are aware that Wireshark is not the most convenient tool for performing intrusion detection, our dissector demonstrates that it’s possible to identify ICS malware on the network using passive techniques. 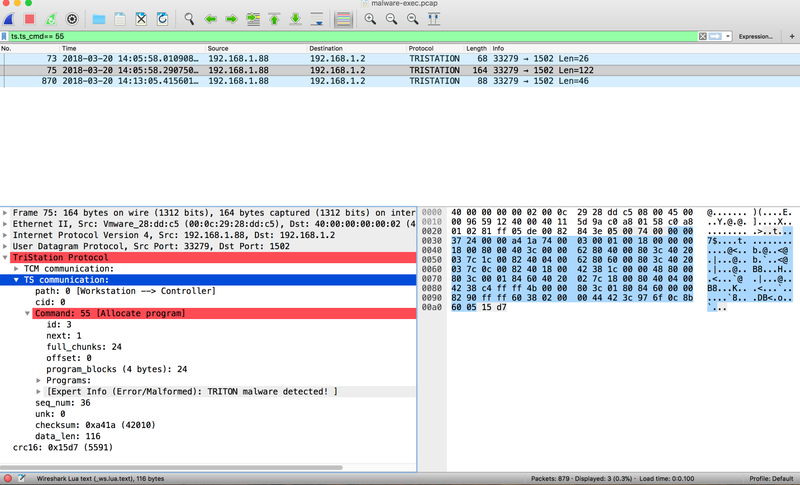 The screen shot above shows the Nozomi Networks Wireshark dissector for TriStation, called the TriStation Protocol Plug-in for Wireshark, identifying the presence of the TRITON malware. How the threat actors could have obtained the targeted equipment, firmware and documentation, based on our own experience. The level of resources (time, money, expertise) required to develop the sophisticated malware. The advanced methods used by the malware for a multi-stage injection of the backdoor into the controller of the Schneider Electric Triconex safety shutdown system, derived from both static and dynamic analysis of the code. A demo of how the TRITON malware executes on a Triconex controller on a live industrial network. Why we think the attacker failed to inject payloads. 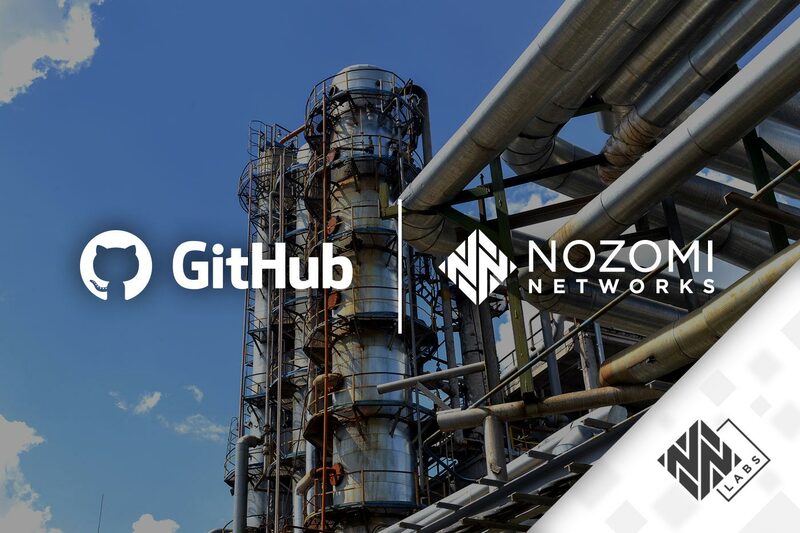 If you are an industrial cyber security researcher or an ICS operator, we urge you to download the free Nozomi Networks TriStation Protocol Plug-in for Wireshark and our TriStation PCAP. They will help you understand SIS communications, identify compromises, evaluate risks and secure your safety instrumented system. Summarizes a project conducted to understand the TRITON malware itself and the resources it took to create it. Helps defense teams simulate SIS controllers on industrial networks, using them like a honeypot to detect reconnaissance scans and capture malicious payloads. Describes the presentation given at Black Hat USA 2018 regarding our TRITON research, including how we used TRITON to implement new programs in the Triconex controller and execute a malicious OT payload. Nozomi Networks Co-founder and Chief Product Officer Andrea Carcanco warned Black Hat conference attendees we likely have not seen the last of TRITON-like attacks. Younes Dragoni is a member of the World Economic Forum’s Global Shaper Community, a worldwide network of young people actively shaping our future through solution building, policy-making and lasting change. His fascination with computer security, and desire to be on the offensive side, began many years ago. 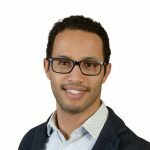 Now, as Security Researcher with Nozomi Networks, Younes thrives on hunting down vulnerabilities in automation devices (ICS/SCADA) and examining malicious software to understand the nature of threats to industrial operations.